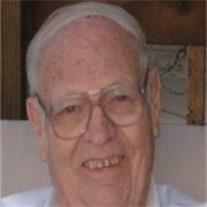 W. Keith Garrett, 81, of Tempe AZ, passed away Friday, October 29, 2010 in Tempe. Mr. Garrett, an entrepreneur was born in Wellsville UT. He served an LDS mission in the North Central States mission and graduated from Utah State University. He also served in the US Army as an officer during the Korean War. He returned to school graduating with an MBA from Brigham Young University and continued his career. He dedicated his life to serving his family and church. He is pre-deceased by his wife Leota and brother Fred. He is survived by his sister Ella Maughan, eight children Keith (Karen), Monte (Michele), John (Delynn), Marcia (Jeff) Penrod, Marie (Bill) Owens, Cheryl (Warren) Schick, Stephen (Brooke) and Adele (Doug) Taylor. He is also survived by 30 grand-children. Visitation is Wednesday Nov. 3, 2010 from 6-8 PM at Bunker’s Garden Chapel, 33 N. Centennial Way, Mesa AZ 85201. Funeral services are Thursday, Nov. 4, 2010 at 1 PM at the Church of Jesus Christ of Latter-day Saints Lakeshore Chapel, 6001 S Lakeshore Dr, Tempe. Additional visitation will be Saturday Nov. 6, 2010 from 10:30 – 11:30 AM at the Allen Hall Mortuary, 34 E. Center St, Logan UT. Interment will follow in the Wellsville City Cemetery.